The Animal Concerns Research and Education Society (ACRES) is a non-governmental organisation (NGO) that advocates for animal welfare. 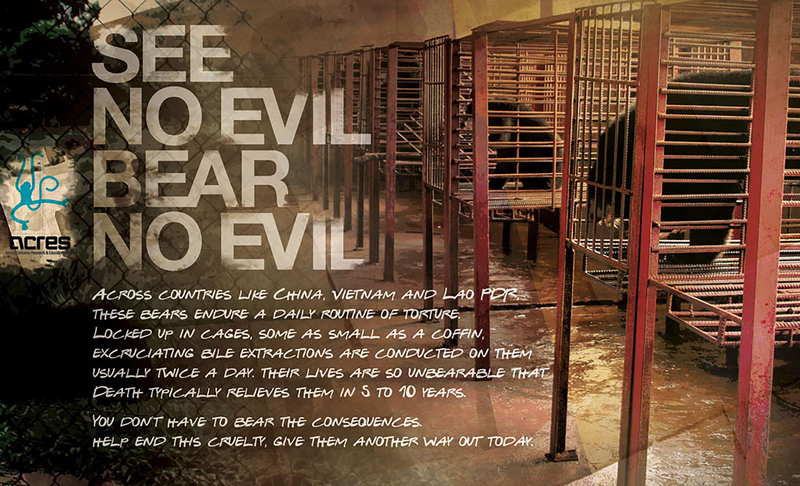 Particularly, ACRES led a movement against the incarceration of dolphins in Resorts World Sentosa for “education and entertainment” purposes, as well as against the cruel practices of bear bile farming in Asia. The main challenge was getting the public to understand and empathise with the plight of exploited animals. For people to understand the gravity of this issue, it was of utmost importance to create a voice for these animals and illustrate the pain inflicted on them in the name of pleasure. For these issues to be addressed, there needed to be widespread awareness and a collective demand for change. 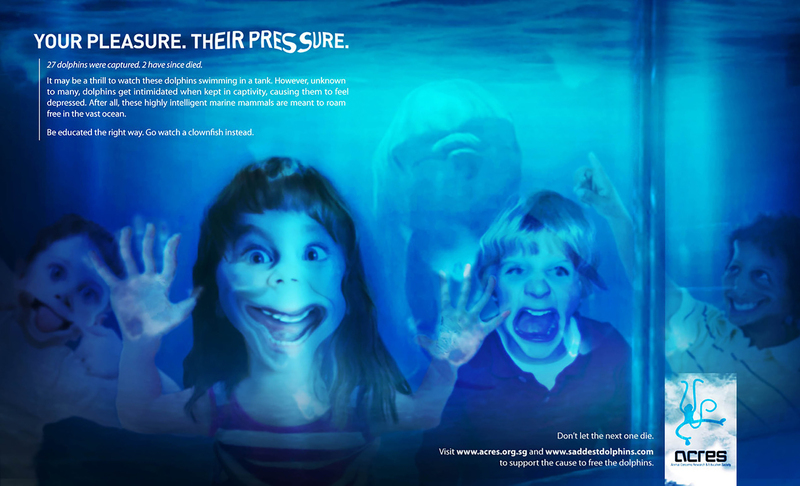 Adwright created posters that flipped the usual perspective of excited children admiring dolphins in an aquarium. People could now see things from the perspective of the dolphins and experience for themselves the stress faced by these animals. The short phrase “your pleasure, their pressure” were used to explain the problem very simply but incisively. The poster had gained international recognition, it raised discussion amongst animal activists beyond Singapore which raised awareness for the “Save the Dolphin” movement. This visual effort garnered the attention of people all over the world, together with a substantial amount of media reports. The movement had also gained a sizeable following, with countless supporters who signed petitions and voiced their unhappiness over the issue. 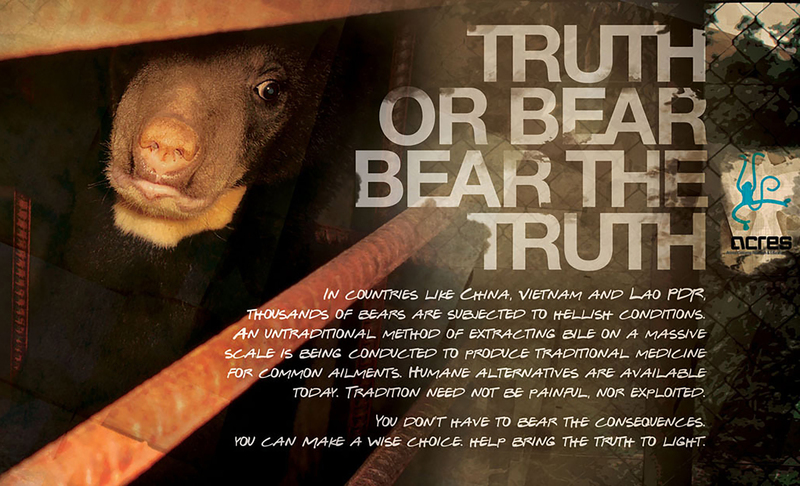 Adwright also created posters to speak up against bear bile farming with the use of images that reflected the reality of these farming practices. 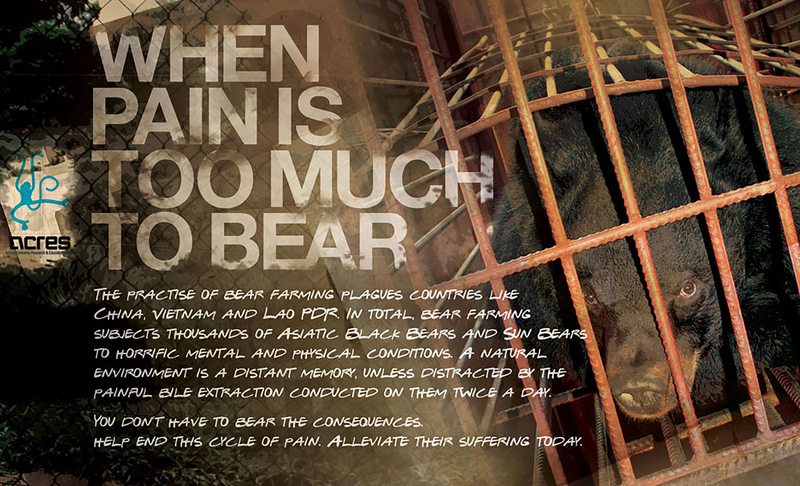 The pictures shed light upon the horrific conditions that these bears are forced to live in while farmers extracted their bile frequently, causing them immense pain. The word play on “bear” was used to capture the attention of the general public, and to aid them in understanding the issue. The posters effectively raised awareness about an issue that had been largely overlooked. It also stirred emotions among animal lovers who then became more convicted to make a change for these abused and forgotten bears.